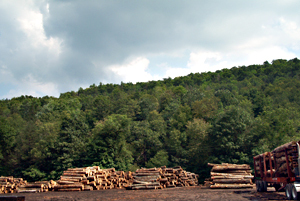 Blue Ridge Lumber Company is a hardwood sawmill located in the beautiful Shenandoah Valley of Virginia. We specialize in Red and White Oak, Poplar, Ash, Hard and Soft Maple, Hickory, Cherry and Walnut. From these species we produce graded rough sawn and quartered/rift sawn lumber ranging in thickness from 4/4 to 16/4 specializing in 8/4 to 16/4. 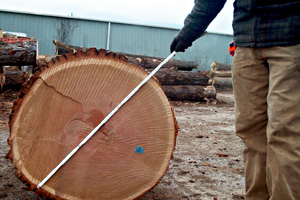 Established in April of 1981, Blue Ridge Lumber opened its doors with a circle mill and log procurement landing in Fishersville, Virginia. Through the next several decades we installed SII dry kilns, constructed our band mill, expanded our workforce to include second shifts and positioned ourselves to reach further into the marketplace by developing a value added plant. The new millennium brought several opportunities for expansion. We opened log yards in Highland County and Covington, Virginia, allowing us to tap into the natural timber resources within the Alleghany Highlands. A log yard in Tappahannock, Virginia gives us access to the Eastern portion of the state. 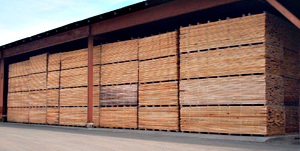 Our Bells Valley concentration yard in Goshen, Virginia is a dry kiln facility that is capable of drying 1.5 million board feet of lumber. This yard, coupled with the dry kilns in Fishersville, gives the company a total of 1.8 million board feet of lumber drying at any given time. Currently, our annual production is over 35 million board feet of lumber. 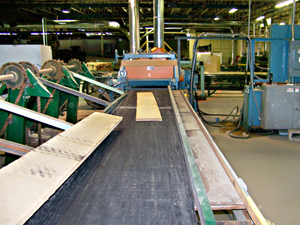 Blue Ridge Lumber took it one step further by renovating an old textile plant into a value-added facility in 2007. Stillwater Woodworking in Augusta Springs, Virginia features a Newman 382 planer and a Mereen-Johnson 431 gang rip saw that allows us to offer S2S and ripping services. We also have several moulder's in use that produce custom flooring, paneling and trim work. Using our own fleet of trucks, we yearly ship an average of 1500 containers of veneer logs and lumber from the ports in Norfolk, Virginia to ports worldwide, including but not limited to the United Kingdom, Italy, China, Japan, and Taiwan. Further, we also ship to our domestic clients and to our neighbors in Canada and Mexico. Our dedication to provide consistent high quality Appalachian hardwoods to a global market, while simultaneously practicing sound forest stewardship, has rewarded us with a loyal customer base. We will continue to do our best in order to deliver the best.